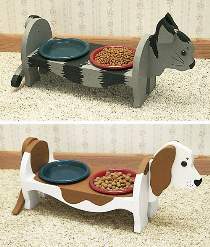 Dog and cat pet dish holders hold two plastic bowls about 4" off the ground so your pet can eat and drink more easily. Plan includes FULL SIZE patterns for both projects pictured. Approximately 22"L x 7"W x 11"H. Order eyes separately below.